Here's all the kit you need to start experimenting with oils. There's an unwarranted mystique around oil painting that has put some artists off from exploring them. If you know the right oil painting techniques, this medium offers a richness of colour and beautiful surface textures. You can paint thick or thin, directly or use glazes. Oils can be used on paper, wood, metal, plastic, canvas and many other surfaces. If you're just getting started, don't be overwhelmed. Be patient with yourself and recognise that it'll take a little time to get the hang of this beautiful medium. But don't overcomplicate things, either. Here we'll share five key materials you'll need to paint with oils. There are hundreds of colours to choose from, but start with a basic palette that covers the spectrum to give you a good mix of warm and cool hues. Most art materials are sold in at least two grades: student and professional. Whenever possible, purchase professional-grade materials as they almost always last longer and the paint goes further. Pro-grade oils also contain more pigment, which will result in more accurate colour mixing, and will be resistant to fading in sunlight. The variety of brushes on offer for oil painting can be confusing. I like Rosemary & Co. brushes, but I also recommend Silver Grand Prix and Trekell. Hog bristle brushes are versatile, not terribly expensive and allow for a variety of applications. Finer-haired brushes, both natural and synthetic, can give you an even smoother finish and make very fine detail possible. 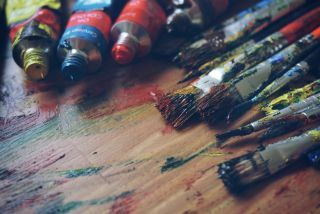 For a more detailed explanation of the different types, take a look at how to choose which paint brush to use. You'll need a palette for your paint. This can be a disposable one, a clean tabletop or a handheld wood palette, or a piece of glass that can be quickly scraped clean. Whatever you use, choose something that's large enough to allow for easy mixing and that can be used ergonomically. The most common surfaces to paint on are canvas, linen and wood. You'll need to prime the surface with a gesso or ground to prevent the acids in the paint from coming into direct contact with it. Acrylic gesso is easy to use and can be applied with a brush or roller. A solid easel is important so that your work is stable, safe and remains at a good working height while you're painting. You can purchase: portable metal tripod-style easels that can be used sitting or standing (1 in the image above); larger H-frame style studio models that are meant to remain in situ (2); or folding French-style field easels (3).